Background/Purpose: The use of 17% EDTA is frequent in endodontics during the cleaning and shaping of the root canals. The aim of the present study is to analyse the chemical action of 17% EDTA on the weight and calcium content of the bovine root dentin through the application of an integral statistical analysis of pared data adjusted to the parametric assumptions. Materials and Methods: Teeth of freshly slaughtered young bovines recently killed devoided of crown and root, were longitudinally sectioned in halves mesial and distal directions. The pulp was extracted with cotton forceps and the cement was scraped with curette and scalpel. Pieces of root dentin were washed with distilled water and dried at 20°C. Each half of root was contacted for 30 minutes with 2 ml of 17% EDTA; the other half was placed the same time in bidistilled water. Each piece was weighted before and after the contact. Previous acid hydrolysis, atomic calcium in the quelant solution was determined through atomic absorption spectrometry. For the statistical analysis the t-test for related samples was applied, since the variables adjusted to a normal distribution and showed equality of variances. In R language, the experimental data were exposed to the analysis of the parametric assumptions, to the tests to compare two paired samples and to the analysis of correlation. Results: A significant difference was evidenced between the weight of the dentin pieces before and after 30 minutes contact with 17% EDTA. A direct but non-significant association between calcium tramped by 17% EDTA and decrease in weight of the dentin was also found. Conclusion: The decrease in the dentinal weight at contact with 17% EDTA for 30 minutes could be associated with the loss of its organic component as a consequence of the mineral loss. The R language, software of free availability and virtual consultation, facilitates the integral statistical analysis of quantitative related paired data. EDTA 17% is frequently used in endodontics as an irrigation solution during the cleaning and shaping of root canals. Its chelating action is effective,  removes dentin calcium and depending on the time of action, it could affect tissue composition  and weaken it. In an ex vivo study we showed the chemical action of EDTA 17% and other solutions on human tooth ducts . Proteins present in the 17% EDTA solution were quantified after irrigating root canals for 40 sec three successive times; soluble noncollagenous proteins would be linked to dentin calcium, and the action of the chelator for a long time would remove the calcium bound to them affecting the organic component of the matrix . On the other hand, when comparing the protein profile of human pulp tissue extracts and bovine after contact with the chelator, we obtained bands of similar molecular weight, which would validate the bovine tooth as a model under the experimental conditions tested . The chelating action of the 17% EDTA solution in human and bovine dentins was also compared with similar results [1,6]. The effective action of an irrigation solution during the preparation of the root canals allows achieving greater cleanliness and helps in the conformation of the ducts. An ideal irrigation solution represents maximum activity and minimal toxicity that affects the dentin tissue . EDTA 17% produced signs of erosion in human and bovine dentin under experimental conditions . The determination of calcium extracted from dentin by contact with the chelator without applying the Mechanical action of instruments in the tissue does not present antecedents. The R Language is free statistical software, resulting from a collaborative project with many contributors, which can be downloaded from the website (http://www.R-project.org/Licenses/). Its application includes the interpretation of the information of the outputs produced [9-11]. The boxplot, diagram consisting of a box and two extensions or whiskers, allows to represent the five descriptive statistics insensitive to extreme data (m=minimum, Q1=quartile 1, Q2=median, Q3=quartile 3 and M=maximum). The box contains 50% of the central data (the upper line represents Q3, the lower one is Q1, the height the interquartile range IQR=Q3-Q1), the line that divides the box into two parts represents Q2 and allows visualization the symmetry of the central data. The upper extent represents, whichever is less, or the maximum value (M) or the limit ‘Q3+1.5*IQR’. The lower extension represents, whichever is greater, or the minimum value (m) or the limit ‘Q1-1,5*IQR‘. The whiskers allow the data to be identified outliers. The longer the box and the whiskers the more variability the data have. Within the statistical inference, the hypothesis tests (contrast of hypothesis or test of significance) allow to judge with respect to a supposed population property according to the information obtained in a representative sample of the same. They address the statistical problem by specifying a given hypothesis and an alternative hypothesis, then try to settle between them based on the experimental information associated with the statistical concept of power and the concepts of type I and II errors respectively define the possibility of taking a false event as true, or a true as false. The parametric tests suppose that the data have a normal distribution of frequencies and the nonparametric ones do not have assumptions of this type, for which the nonparametric ones can be used always, but the parametric ones are preferable for their greater capacity of resolution. The student t-test is parametric and allows to check the equality of the means of two samples or to check if the average of a sample is equal to a determined reference value. The Wilcoxon signed rank test (suitable for paired samples) and the U Mann-Whitney test (the most extended for independent samples) are the alternatives for when the data do not adjust to a normal distribution. The incorrect use of a parametric test with variables that do not conform to normality, results in inefficient estimators and contrasts of approximate significance. The normality of a series of data is estimated by graphs and/or hypothesis tests that state that the response variable fits a normal distribution. The Shapiro-Wilk test, the most used and efficient when the sample size is not large, in R language is obtained with the function shapiro.test (X), where X represents the numerical vector that contains the data of the variable in study. To test the variances of two samples, Fisher's F-test is used, and for more than two data series, the Bartlett test and the Levene test are available (the latter is independent of the number of contrasting groups), which in R language is performed with the var.test function. The objective of this work is to determine, by means of an integral procedure in R language, the statistical difference in the weight of the bovine dentine before and after the contact 30 min with EDTA 17% and to weight the association between the decrease of the dentinal weight and the calcium atomic present in the solution. The crown of 5 unirradicular teeth of young cattle of 2-3 years was eliminated. The roots were undestruded mesially and distally and the pulps were extracted with a cotton clip. The cement was weighed with curette and scalpel and the dentine pieces were washed with abundant distilled water and dried at 20°C. Half dentin from each root was contacted with 2 ml of 17% EDTA for 30 min and the remaining half of the same tooth, with equal volume of bidistilled water (Control). The weight in grams was determined with precision analytical balance (Acculab, Buenos Aires, Argentina) of each piece of dentine, before (AT) and after (DT) treatment by contact with EDTA 17%. In addition, atomic absorption spectrometry quantified atomic calcium (CA) present in the solution linked to the chelant, after hydrolysis in an acid medium at pH=1.5-2.0. It was expressed in mg/dl. CA <- c (173.9, 208.3, 145.4, 101.7, 135.1) #Create the CA vector with the atomic calcium data. points (Socks, pch=24, col="red") # Point out the socks with a red marker. cor.test (AT, DT) #For independence between samples, before and after treatment. t.test (AT, DT, var.equal=TRUE, paired=TRUE) #Options (alternative='two.sided', conf.level=0.95). wilcox.test (AT, DT, paired=TRUE) #Paired data are indicated with the argument paired=TRUE. plot (DP, CA) #Represents the joint behavior of the DP and CA variables. cor.test (DP, CA) #Quantifies the association between the previous variables. No CA was detected in the solutions with the control dentines or in bidistilled water. The matrix with the experimental data obtained for the weight of the pieces of bovine root dentine and CA content in the 17% EDTA solution after 30 min of contact and the statistical indicators are presented in Table 1. The coefficient of percentage variation, by relating the standard deviation with its average, it allows to compare the dispersions of different samples with positive measures. Similar variability is observed between the samples AT (13.02%) and DP (13.63%), and somewhat similar between DP (20.33%) and CA (26.36%). Table 1. Matrix of data with the weight of bovine root dentins before (AT) and after (DT) of treatment with EDTA 17%, weight reduction and atomic calcium present in the solution. In Figure 1 the box diagrams and extensions of the AT and DT data series suggest that they have similar, symmetric distributions (in both cases Q2 are closer to Q3, so a negative asymmetry in the data can be estimated) central) and without outliers (data that are outside the whiskers and are identified by an asterisk). As the boxes overlap along the vertical axis, it can be assumed that the average weights do not differ beyond the random variation. However, the statistical difference between the average weights can only be determined with a parametric or nonparametric hypothesis test. 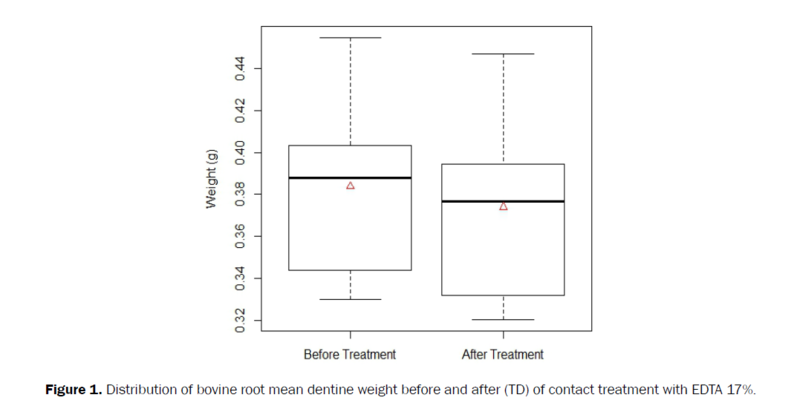 Figure 1: Distribution of bovine root mean dentine weight before and after (TD) of contact treatment with EDTA 17%. The decision on the correct procedure to compare paired samples, between a parametric test (Student's t test) and a nonparametric test (Wilcoxon), was based on the analysis of the parametric assumptions (normality, homoscedasticity and independence) whose results are presented in the Table 2. The probability values for both normality tests (0.7611 and 0.7142) being greater than the type I error (0.05), allow us to estimate that the samples AT and DT come from a population with normal distribution, being correct its subsequent analysis with the parametric procedure test-t.
Table 2. Analysis of the assumptions of normality, homoscedasticity and independence. When the variances of both samples (AT and DT) are contrasted, the probability value reported in Table 2 for the Fisher test (0.964), being greater than the type I error (0.05), leads to think that the variances are equal and the variant of the test t for paired samples must be resorted to, using the argument PAIRED=TRUE. Finally, to determine if the samples AT and DT are not independent, we used the Pearson simple correlation analysis, which in R language is performed with the cor.test function (AT, DT). The probability value reported in Table 2 for the correlation (7.869 e-06=0.000007869) being less than the type I error (0.05), leads to reject the hypothesis that the samples are independent, then the variant must be resorted to of the test t for related or paired samples with the argument var.equal=TRUE. The results of the t-test, in its version for paired samples and equality of variances, are reported in Table 3. For comparative purposes, the results of the Wilcoxon test are also presented, not suitable for the current experimental data. Table 3. Student t and wilcoxon t-tests for related samples. The probability value of the test t (0.0002545), being less than the type I error (0.05), leads to conclude that the difference between the means of the samples AT and DT is significant (the loss of weight in the dentins is significant due to contact with EDTA 17%). The Wilcoxon signed rank test would have been correct in case the samples did not adjust to the normal distribution, and the result would lead to a different conclusion (p-value=0.0625). Before quantifying the link between the DP and CA variables in the solution, the dispersion diagram of Figure 2 was developed, which allows us to estimate a direct but not significant association between the variables. 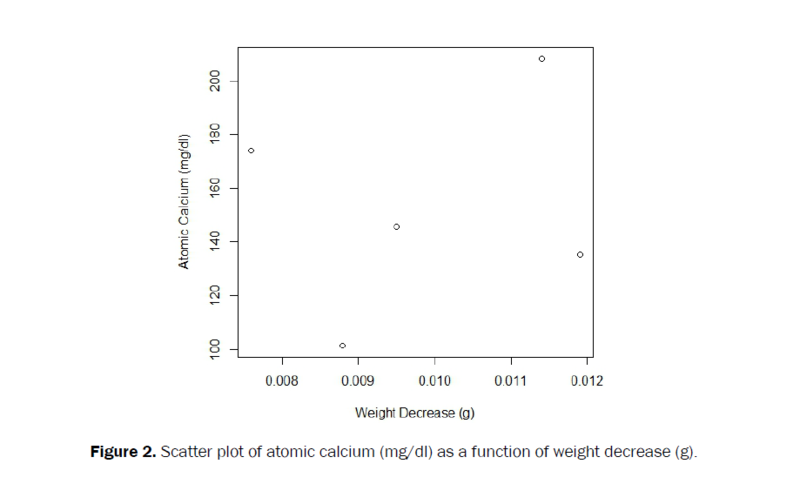 Figure 2: Scatter plot of atomic calcium (mg/dl) as a function of weight decrease (g). The assumption previously was corroborated with the results of the Pearson correlation analysis presented in Table 4, after determining the normality of both variables. The probability values (0.6825 and 0.9769) of the Shapiro-Wilk test applied to the variables DP and CA, indicate that both adjust to a normal distribution and therefore the analysis with the Pearson correlation is relevant to quantify the magnitude of the association between them. The correlation coefficient (r=0.202) suggests that the variables show a direct association, but that it is not significant (p-value=0.7445). Table 4. Correlation analysis between weight reduction (DP) and atomic calcium (CA). EDTA 17% captures bivalent cations; in front of dentin tissue it joins the calcium it has penetration power  that allows the contact between the topical substances and the dentin for better cleaning and sealing in the restoration. Uniradicular human teeth extracted in a healthy state are scarce, usually obtained for orthodontic reasons . This limits their availability to use them. Thus, it was experimentally tested with teeth of other species, including bovine . The incisors are larger than the same humans and are easily obtained from young animals slaughtered for slaughter [15,16]. They were used as an experimental model in studies of the action of irrigation solutions in root dentin [13,17,18]. Previous in vitro studies confirmed the efficacy of the chelator according to the joint action of the solution and the instruments . In the present work ex vivo, the changes caused by the exclusive chemical action of EDTA 17% on contact with bovine root dentin, without incorporating the action of instruments. The time tested, superior to that usually applied during the treatment, would magnify the chemical action of the chelator on the dentin. The CA quantified in EDTA 17% and the DP of the bovine root dentin, before and after 30 min of contact with the solution evidenced it. EDTA 17% bufferate is used at pH 7.3. It could remove soluble or partially soluble components from dentin, including a non-collagenous protein, phospho-phorin, which is associated with the calcification process . Thus, the chelating solution eliminates superficial calcifications and also affects properties of the dentine, such as its hardness,  reducing it markedly when its application is prolonged over time [2,21]. In the endodontic treatment, for the cleaning and conformation of the root canals, 17% EDTA is used for a time less than 15 min, and this solution is alternated with other irrigation solutions. In the present study, in which EDTA 17% contacted bovine dentine for 30 min, an average of 155.9 mg of CA extracted every 100 ml of chelating solution was obtained, confirming previous findings [3-17]. The analysis of the parametric assumptions with the tests of normality, homocedasticity and independence of the weights of the dentins corresponding to the variables AT and DT, endorse the use of the variant of the test t for paired samples and equality of variances. The dentine weight decreased significantly (0.00984 g) in the time tested, concluding that the differences between the means are highly significant when obtaining a p-value=0.0002545. In addition, a direct association (r=0.202) but not significant (p=0.7445) between dentine weight loss and presence of CA in the chelating solution was determined. The presence of CA in the solution could be due to the partial dissolution of dentine phosphor proteins due to the prolonged contact time with EDTA 17% and not exclusively to the chelating action of said solution. These results coincide with a previous study in ex vivo human teeth, where the presence of calcium was demonstrated in the solution aspirated from the root canals during irrigation . Since dentin has 70% inorganic component and 20% organic component, and that the hydrophilic protein phosphoforin bound to the matrix rich in collagen type I binds calcium, sodium and potassium in the mineralization fronts, [22,23] the extraction of minerals affects the hardness of the dentin tissue decreasing its resistance and stability in the post-treatment time. Basically, dentine partially demineralized by an endodontic treatment could be remineralized by calcification with calcium hydroxide paste, but the irreparable loss of proteins affects its natural stability. The R language, in addition to its free availability and having a wide field of consultation on the Internet, through a simple routine, facilitated the comprehensive statistical analysis of samples of paired data. Faculty of Dentistry, National University of Tucumán (FOUNT), Secretariat of Science, Art and Technological Innovation (SCAIT), National University of Tucumán (UNT). Moreira MD, et al. Structural analysis of bovine root dentin after use of different endodontic auxiliary chemical substances. J Endod. 2009;35:1023-1027. Deus FG, et al. Longitudinal and quantitative evaluation of dentin demineralization when subjected to EDTA, EDTAC and citric acid: a co-site digital optical microscopy study. Oral Surg Oral Med Oral Oral Pathol Radiol Endod. 2008;105:391-397. Salas MM, et al. Chemical content of solutions after irrigation of the tooth root canal. Acta Bioquim Clin Latinoam. 2012;46:365-373. Verdelis K, et al. Effect of chelating agents on the molecular composition and extent of decalcification at cervical, middle and apical root dentin locations. Endod Dent Traumatol. 1999;15:164-170. López ME, et al. Evidence of the protein content of bovine and human dental pulps by the action of endodontic irrigation solutions through electrophoretic patterns. Saudi Endod J. 2013;3:70-76. Serper A and Calt S. The demineralising effects of EDTA at different concentrations and pH. J Endod. 2002;28:501-502. Faria G, et al. Evaluation of chlorhexidine toxicity injected in the paw of mice and added to cultured L929 fibroblasts. J Endod. 2007;33:715-722. Fernández LM. In vitro study of erosion caused by EDTA on root canal dentin. Rev Od Mex. 2012;16:8-13. Best D and Roberts D. Algorithm AS 89: The upper tail probabilities of Spearman's rho. Appl Stat. 1975;24:377-379. Walpole R, et al. Probability and statistics for engineers. (8th edn.). Pearson Prentice Hall Hispanoamericana SA, Mexico. 1999;pp:358-400. JM Chambers and TJ Hastie. Linear models and statistical models (2nd edn.). Editors: Wadsworth and Brooks/Cole. 1992. Baumgartner J, et al. A scanning electron microscopic evaluation of root cannal debridement using saline, sodium hypochlorite, and citric acid. J Endod. 1984;10:525-531. Puentes B and Rincón S. Chemical and mechanical partial characterization of bovine incisor teeth as a possible model for the study of dental materials. Rev Fed Colombian Odont. 2004;20:20-32. Schilke R, et al.. Comparison of the number and diameter of dentinal tubules in human and bovine dentin by scanning electron microscope investigation. Arch Oral Biol. 2000;45:355-361. Vadhaty A, et al. Efficacy of chlorhexidine in disinfecting dentinal tubules in vitro. Endod Dent Traumatol. 1993;9:243-248. Phrukkanon S. The influence of the modification of etched bovine dentin on bond strengths. Dent Mat. 2000;16:255-265. Azuero M, et al. Comparison of three irrigating solutions used in endodontics. Review article. Rev Pontif Univ Javeriana, Bogotá, Colombia. 2005;13:1-11. Torabinejad M, et al. A new solution for the removal of the smear layer. J Endod. 2003;29:170-175. Zehnder M. Root Canal Irrigants. J Endod. 2006;20:1-10. Lopez GL, et al. Action of endodontic irrigation solutions on the micro hardness of the root dentin. Rev FOUNT. 2015;34:12-7. Patterson S. In vivo and in vitro studies of the effect of the disodium salt of ethylendiamine tetracetate on human dentin and its endodontic implications. Oral Surg, Oral Med, Oral Pathol. 1963;18:83-103. Koskinen K, et al. Dissolution of bovine pulp tissue by endodontic solutions. Scand J Dent Res. 1980;88:406-411. Lopez M, et al. Biochemical aspects of the organism and the oral cavity. Graphic Services Ed. Tucumán, Argentina. 2013;209-233.